CollectionHq is a collection performance solution for libraries. They innovate the way libraries select, manage and promote their collections. They provide guidance on action to take to improve the performance of a collection. The app is has been adopted by hundreds of libraries in the UK and US. 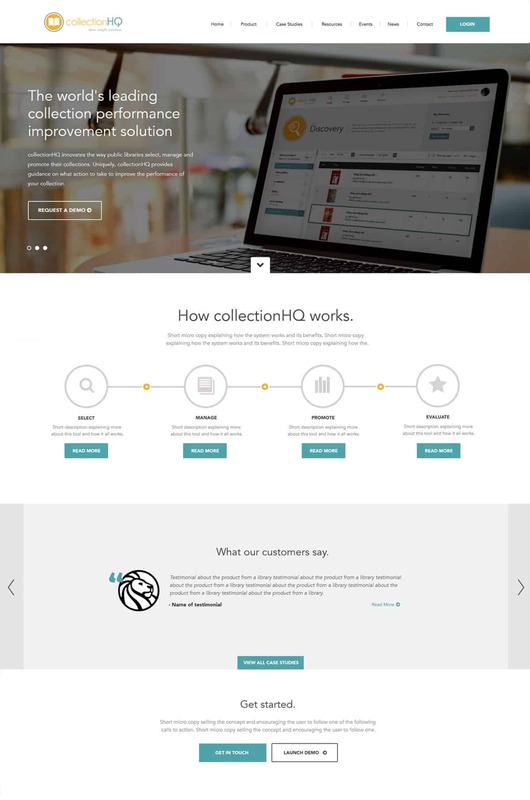 CollectionHQ asked us to help with the design of their new website and web application design. We worked closely with the collectionHQ in-house dev team to completely redesign the user interface for the web app. The application features several unique tools for presenting and comparing library data including a module for discovering new books, all of which we redesigned to make more intuitive and engaging to use. We created a new minimal interface design and visual language based on illustration and custom iconography to make the tools easy to find and identify. The web app was built to work across a wide range of screen sizes and browsers. To coincide with the launch of the new version of the web app we also developed the brand new collectionHQ website, which alongside the web app integrated the new company logo and branding. The website was designed to offer a more streamlined user experience which presented the new application and feature set, with a focus on increasing software demo sign-ups. The website was fully integrated with the WordPress content management system to allow for easy content updates and allow the team to add events and news. The new website ties in the graphical elements we created for the app to explain the new feature set and focuses the user on claiming their free app demo. NSDesign offered advice, creativity, and support to help us achieve the website that we wanted. As a result, our new website is fresher, easier to navigate, and we can manage the content independently.